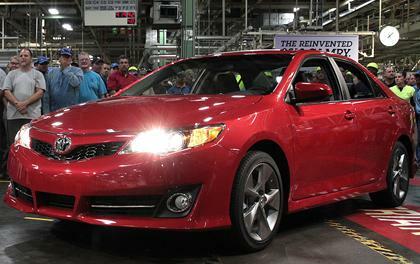 Consumer Reports has picked what it believes is the best family sedan: It's the 2012 Toyota Camry Hybrid. Though few observers were particular bowled over the new Camry's less-than-bold looks, Consumer Reports found a lot of practical considerations. "The Camry has a nicer interior, more responsive handling, and better fuel economy than previous models," the magazine says in a statement. And the gas mileage in the hybrid? an "amazing" 38 miles a gallon. The hybrid was the best of the three versions that the magazine tested. The other two was the standard four-cylinder and the V-6. Prices for the tested sedans ranged from $23,830 for the four-cylinder Camry LE to $33,720 to the V-6-powered Passat SEL Premium. The hybrid was $29,052. 2001 Toyota Camry in Central FL. MUST SELL NOW!! !